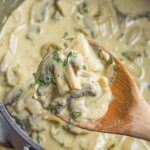 You’ll want to put this Creamy Keto Mushroom Sauce on just about everything! It’s rich and perfect, poured over a thick grilled rib eye steak. Place a saucepan over high heat, add the butter, garlic, onion, salt, and pepper and saute until the onions start to turn translucent. Add the mushrooms and saute for 3 minutes before dropping the heat to low. Add the Worcestershire sauce, dijon mustard, and cream. Simmer for 10-15 minutes until the sauce thickens. Stir through the tarragon and serve.